Prominent Melbourne photo artist, Polixeni ‘Poli’ Papapetrou, has sadly passed away after a long battle with breast cancer. She was just 57 years old, and was first diagnosed with cancer in 2007. Six years ago the photographer defied odds by fighting off the cancer, after doctors told her in late-2012 she had only days or weeks left to live. In the years that followed, and those that preceded, Poli created some of the finest Australian photo art, which has been collected and exhibited around the world. She will be remembered as one of the country’s great artists. An extensive collection of her works are held at over 25 Australian public art and cultural institutions. Her death was announced yesterday by husband, Robert Nelson, The Age‘s visual art critic. Naomi Cass, director of Melbourne’s Centre of Contemporary Photography which Poli was a founding member, told The Age the photographer ‘lived an important and magnificent life as an artist, as a feminist, as a mother, as a wife, as a daughter, and a very significant member of the Australian arts community’. Delphi 2016, from the series, Eden. Pigment ink-jet print, 127.5 x 85.0 cm. Courtesy the artist, Michael Reid Gallery (Sydney) and Jarvis Dooney Galerie (Berlin). Photo: Polixeni Papapetrou. Poli was the first born daughter of Greek migrant parents, who came to Australia in the 1950s. Her first career was as a commercial lawyer after studying law at University of Melbourne, but began taking pictures after being inspired by the work of famous American photographer, Diane Arbus. For two decades Poli had been exploring the themes of childhood, and in later years featured her children, Olympia and Solomon, in photos. There has been an outpouring of tributes as the photo industry and art world, along with Poli’s long list of friends, learns of the great loss. ‘…I really got to know her in 2014 when we were both in an exhibition in Korea, at the Dong Gang Photographic Festival. I was impressed not only by her work but how she organised her life. She was one of those people who got things done. She knew how to find things, and find out about things, and how to access the world though the internet. She had been diagnosed with cancer and was often quite sick on the trip from her medications, but it never stopped her. She was amazing. I visited her a few times in the last year when she was confined to her bed in Fitzroy. She was keen to do more work, even in that condition and was able to produce new stuff. Once she said, “It’s a miracle I’ve survived this long.” She suffered, but was always supported by her husband Robert and her two children. There was always so much love in the room the visits were never depressing. Polixeni Papapetrou’s exhibition, My Heart – still full of her, is currently on show at Michael Reid Gallery in Sydney until April 24. Her work will also show in a group exhibition at RMIT University, Chaos and Order, running from April 13 – June 09. 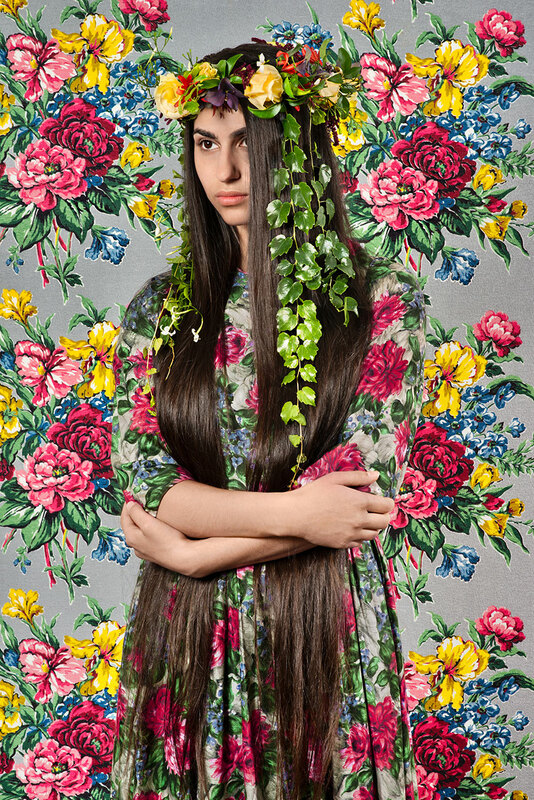 This entry was posted in Deck left, News and tagged australian photographer, poli, polixeni papapetrou by Keith Shipton. Bookmark the permalink.